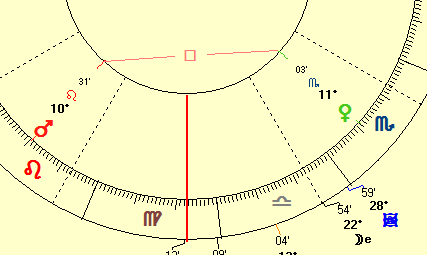 In this article we present our empirical research regarding the Venus Mars square (aspect of 90°) in the natal chart. To analyze the aspects and astrological configurations we make use of the AstroDatabank, which currently contains far over 50,000 birth data. Unlike our statistical research projects, there is no software to help us find common traits and characteristics concerning planetary aspects and there are no control groups and no chi squares etc. that we use either. Also, we make a difference between applying and separating aspects. Mind though: every aspect is part of a larger whole and hardly ever stands alone or apart. This will especially be the case when other exact aspects (0°00'-0°01' orb) can be found in the natal chart because these will overrule the less exact ones. Let's first take a look at the general research results concerning the Venus-Mars square aspect in the natal chart of men and women. receive for their expertise in some field. this square aspect are cerebral, intellectuals. They are active or work in the fields of publishing, PR etc. This comes as no surprise because, following research by the Dutch astrologer and Medical Doctor Fred Opmeer, women with this aspect are struggling with and trying to cope with an unfaithful husband (partner). Let's now take a look at the research results concerning the APPLYING Venus-Mars square aspect in the natal chart of men and women. Below is an image of an applying Venus-Mars square. 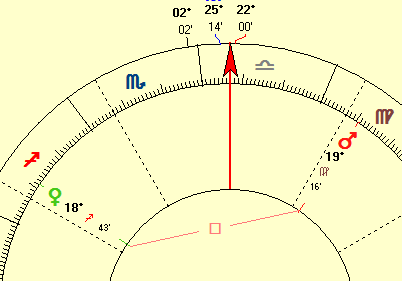 An applying aspect occurs when the aspect is still to become exact because the degrees and minutes of the two planets are coming closer together to become exact (at the same numerical degree and minute). In other words, both planets are moving together to build an exact aspect (orb 0°00'). Let's now take a look at the research results concerning the SEPARATING Venus-Mars square aspect in the natal chart of men and women. Below is an image of a separating Venus-Mars square. A separating aspect occurs when the aspect has been exact already and the degrees and minutes of the two planets can no longer become exact (at the same numerical degree and minute). In other words, both planets are moving apart from the exact aspect (orb 0°00').